All women love these flowers... but the feeling's *not* mutual. 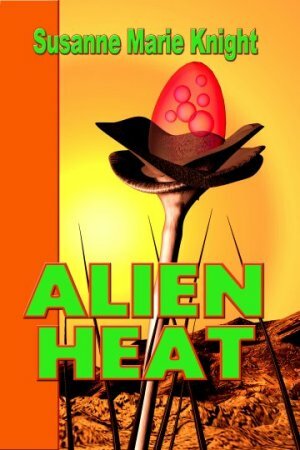 A cataclysmic bombardment by meteorites drastically alter Earth's atmosphere... and bring strange alien plants that have a mind of their own. Because of “mutant” powers, only Glyneth recognizes the threat these Venusian flowers pose not just to humans, but to Earth itself. Major Lucas Jefferson reluctantly abducts Glyneth as a breeder for his country. But "Lady Bulldog" teaches him that might is not always right. Can he learn from this villager to fulfill the ancient prophecy of uniting the old ways with the new? Major Lucas Jefferson's mission is to invade a "primitive" village and abduct women. In this scene, Glyneth, the unwilling victim, escapes, but then returns to help him after he has been knocked unconscious by an outside force. When Glyneth reached for the binding cloth, the man held onto her wrist with an unrelenting grip. “No. Stay. I must... thank you.” His uniform shirt was tight without the armor, and through the thin material she saw bulging biceps, powerful pectorals, and a host of manly muscles. She gulped down hard. She felt so strange around this man. Unfamiliar emotions stabbed at her, causing confusion. No! This won’t do. I must control myself. “It would be best for me.” Warily eying him, she took a chance on his weakened state and sat a yard away from him. The ten sons of Canusa. Glyneth scratched at the fake scar on her forehead, then released her hair from the restricting ponytail. Not having her head covered in a man’s presence made her feel extremely vulnerable. “And so that makes it acceptable, hmmn?” For some perverse reason, she was enjoying herself. Fighting with words was far more exhilarating than thrusting with swords. Trailing behind like a stubborn mule, she dug in her heels, but it was no use. She was no match for his strength, even in his weakened, fevered state. Instead of answering, he reached over and flattened his palm against her breast. “Get away from me, you... you beast!” Tears springing to her eyes, she shoved him away with her unshackled hand. And blast the man, but the next minute, he started snoring! Glyneth chewed on the fingernails of her free hand, trying to figure her next move. She raised her left arm, only to drag his arm up, too. There was nothing else to do but ease down on the sand and close her eyes. The man had won this round. But, she still had hope. As the ancient saying went, tomorrow was another day.